Create Your Own Custom Design! This MagicBand 2 Skin features favourite naughty little blue alien! Our specialist adhesive ensures that the Skin stays firmly in place while allowing for trouble free removal when you are ready to change your style. All of our MagicBand covers are precision cut and professionally produced to ensure a perfect fit to the colored portion of the MagicBand and are suitable for both smaller and larger MagicBands. *Excludes orders that contain personalized products. © 2014, 2015, 2016, 2017, 2018 & 2019 Magic YOUR Band Ltd. All Rights Reserved. 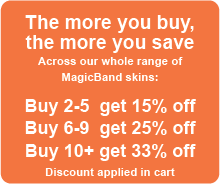 Magic YOUR Band Ltd. is not in any way affiliated with The Walt Disney Company or Disney Enterprises, Inc. MagicBand and MagicBand 2 are registered trademarks of Disney Enterprises, Inc.